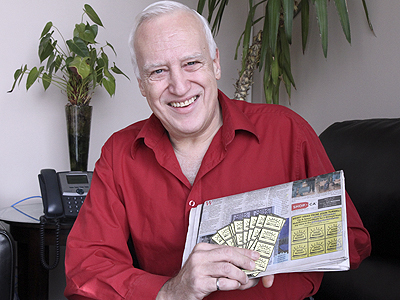 John Turmel pictured with his Gold Nuggets coupons. Brantford resident John Turmel has taken his longtime fight to change the Canadian banking system into his own hands. Turmel holds the Guinness World Record for most elections contested, having run in 77 election campaigns at all levels of government since 1979. For each election he ran on a platform in support of alternative currencies. He says Gold Nuggets are an interim fix for the payment of interest. More than 50 local businesses accept Turmel’s Gold Nuggets for various discounts. A full list is available online at http://www.goldnuggetnetwork.com. The coupons can be purchased at Bob’s Tobacco on Dalhousie Street for 25 cents each. When Turmel ran for mayor of the City of Brantford in the 2010 municipal election, he campaigned using another form of alternative currency – Bus Bucks. “I proposed paying kids to work for bus tickets,” Turmel said. “That is a perfect example of how a little piece of paper can mobilize youth to service. Bus Bucks are labour-based (alternative currency).